The introduction of energy is quite difficult to explain and grasp. It changes the physical systems. Simply put, when we speak about introduction of energy, we refer to light, electricity, heat, noise, electromagnetic radiation, radio waves or vibrations. Building the foundations of an offshore platform using pile driving for instance is the source of a lot of energy releases, whether in the form of noise or vibrations. Although energy is a natural process, it does not always have a positive effect on other natural processes. Human activities can take a disproportional amount of energy out of a system or add to it. This can have a negative impact on the marine environment. Why should we pay attention to the introduction of energy? Generally, the strongest effects from these activities on the marine environment are caused by underwater noise. Heat can also be an issue in the case of cooling water systems. Finally, electromagnetic radiation can be expected in the case of activities related to electricity. Yet, there is very little information on the effects of electromagnetic fields on marine life. 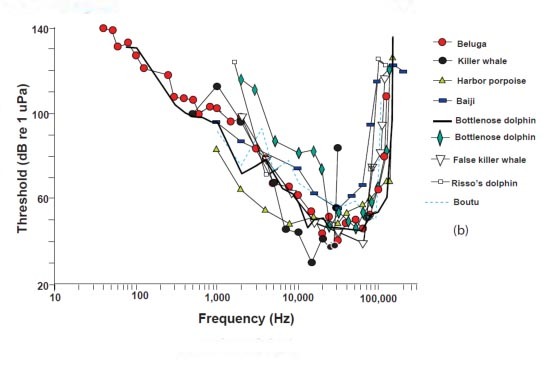 Most studies have dealt with underwater noise. Impacts of man-made energy on the marine environment are related to the prevalence and timing of any activity as well as the distribution and abundance of sensitive marine life. For instance, in the case of offshore construction, shipping activities and pile driving (i.e. foundation building) add noise to the already established ambient noise levels. The disturbance from shipping (from fishing and recreational vessels) lies in particular in the fact that the noise input from these activities can be continuous. Loud impulse noise and ambient (continuous) noise should therefore be distinguished. What kind of damage does underwater noise cause? Attention has been raised on the topic of underwater noise and its effects on marine life. Yet, the effects of underwater noise are not fully understood. One reason for this is that only for a few species of mammals and fish, tests have been performed to identify hearing range and sensitivity. But even if an individual hears the noise, we are not sure how it will react or what damage will be done. It could avoid the source and be chased out of important areas, for example spawning grounds. It might influence its ability to detect food. Its hearing could get damaged at close ranges with further effects on communication about food, danger and reproduction. Research proved that marine fauna certainly do experience effects from noise exposure. It has been established for example that stranding incidents in beaked whales were caused by underwater noise from military activities. The graph shows some hearing curves of toothed whales. Some underwater noise can be heard by marine life over distances of dozens of kilometres. For example pile driving sound can be as loud as 250 decibels* at the source and can potentially be picked up by a harbour porpoise over distances of at least 80 km under certain circumstances. Although, we cannot compare these levels to in-air values without some corrections, we can say that that pile driving is quite loud! 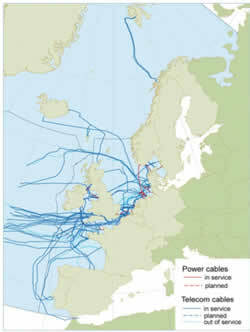 What are the main sources of energy in the marine environment? 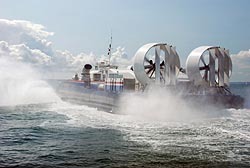 Human sources of energy in the marine environment are commonly related to transport, mining and fishing and construction. The effects of recreation and industries can also be experienced in coastal waters. Military activities, which produce noise. The adoption of the Marine Directive (MSFD 2008/56/EC) and specifically of Descriptor 11 has given a great impulse to the market of underwater sound equipment, engineering and advice. There is also more interest for research in this field and governments, companies and institutes have already performed a great amount of studies on the topic. As a follow up to the Commission Decision on criteria and methodological standards on good environmental status (GES) of marine waters (Commission Decision 2010/477/EU), the Marine Directors requested the Directorate-General for the Environment (DG ENV) in 2010 to establish a technical subgroup under the Working Group on GES (WG GES) in relation to the Marine Strategy Framework Directive 2008/56/EC (MSFD) for further development of Descriptor 10 Marine Litter and Descriptor 11 Noise/Energy. For practical reasons the work was carried out by two separate groups. The reports compile the recommendations regarding Descriptor 10 (Marine Litter) and Descriptor 11 (Noise). The Environmental Impact Assessment (EIA) Directive (2011/92/EU) is applicable at the level of individual public and private projects. Development consent (e.g. permission/approval/authorisation) for projects, which are likely to have significant effects on the environment, should be granted once the environmental impact assessment has been carried out. The EIA Directive distinguishes between projects requiring a mandatory EIA (so-called Annex I projects) and those where Member State authorities must determine, in a procedure called "screening", if projects are likely to have significant effects, taking into account criteria in Annex III of the Directive (so-called Annex II projects). Under both the mandatory EIA and the screening procedures, depending on the type of project, a number of project's characteristics including nuisances and/or noise should be considered. In addition, recital 12 of Directive 2014/52/EU amending Directive 2011/92/EU further focuses on the protection of the marine environment and urges Member States to take into account during the EIA and screening procedures particular characteristics of projects with regard to technologies used such as seismic surveys using active sonars. You can access here the new EIA Directive (applicable as of 16 May 2017) and the current EIA Directive.